In this post, I am introducing newly-launched theme store. That is HappyThemes Store, which has more than 18 Happythemes premium WordPress themes. This Happythemes Review 2018 gives the basic idea. Creating a new blog is very easy. 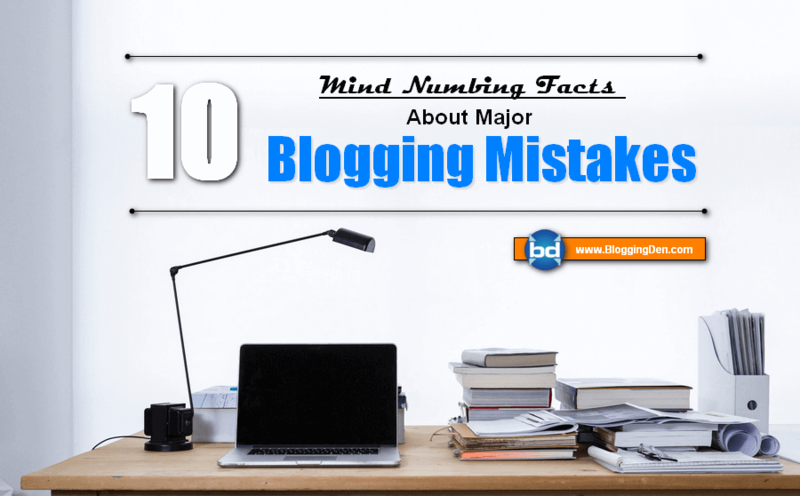 But the blog maintenance is the major task of every blogger. Choosing attractive Premium WordPress themes, configuring suitable WordPress plugin as per our needs is very important. There are hundreds of WordPress theme developers are updating their updated themes to WordPress theme shops. I used most of the themes from different theme stores. But every theme is different in their appearance and functionality. Recently, I purchased lifetime membership from one of the WordPress themes stores. Using these themes for 7 months. I feel very good. So I decided to introduce this themes store to my readers. That theme store name is Happy Themes. Really these are Simple Premium WordPress themes. I spend more dollars on Responsive Premium WordPress themes. But no one is perfect for my needs. If we want more additional options within the theme like affiliate marketing purpose, advertising purpose, and Responsive purpose, you need to spend more than $60 per theme. But this happy themes team are providing more than 10 Premium themes at affordable prices. 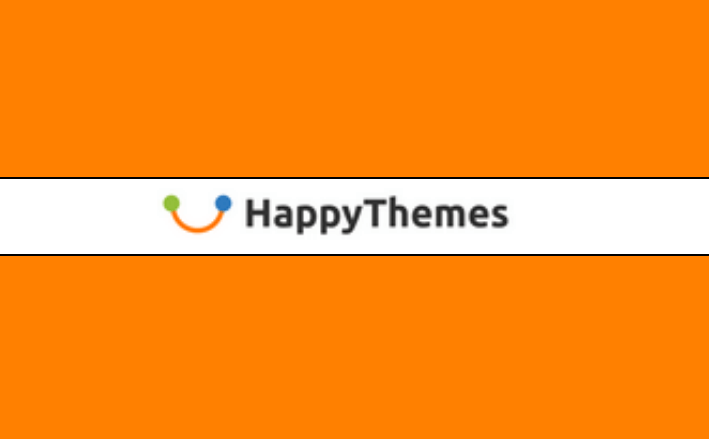 HappyThemes Review: Why these themes? How to get lifetime membership with 40% Discount? Happy themes are a brand new WordPress theme shop started in February 2017. The theme store is running with passionate and innovative developers. The team has very good experience in designing and website developments since 2004 and they make some useful plugins since 2008. The team has an experience in designing and developing WordPress themes and plugins in ThemeForest themes stores as an author. By using this experience, they started a new brand Premium WordPress themes online shop. Happy themes doesn’t come with thousands of fonts and hundreds of layout options. The themes are clean, fast loading, flexible and extremely easy-to-use to start a new blog and online business quickly. Beautiful designs: They are providing awesome designs with easily customizable way. Premium Support and Updates: The Happythemes has an awesome theme support forum to get easy support. The team is always ready for answering your questions. You will get the solution within 1 to 2 hours. Responsive: All themes are designed as responsive. Themes are fit in all screen devices. 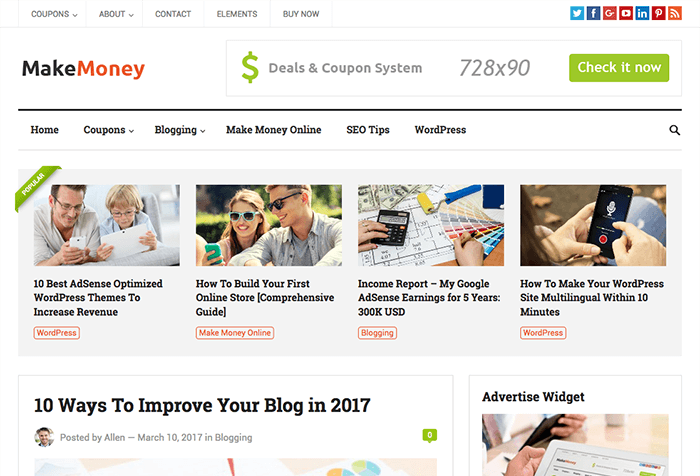 MakeMoney theme is a premium quality WordPress blog theme. 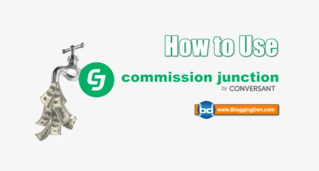 It is a good choice for any nice blogger and affiliate marketer. 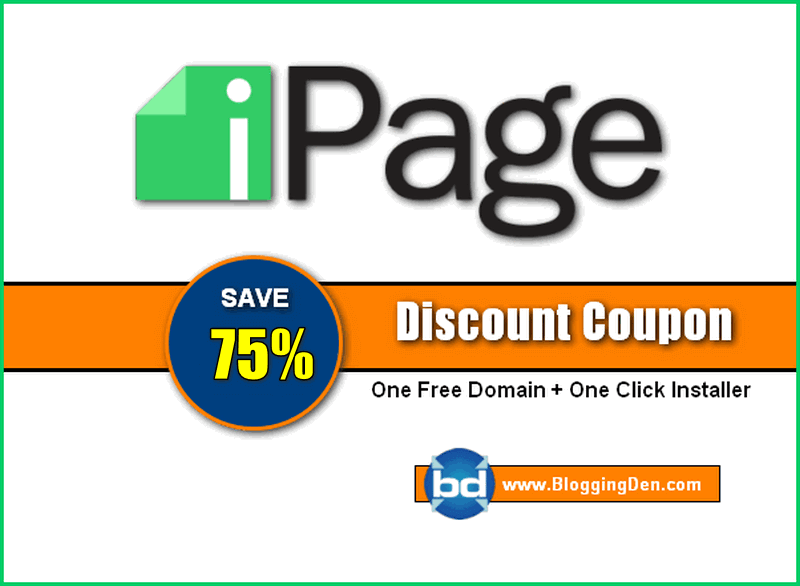 This theme is developed with inbuilt Coupon/Deals functionalities to promote discounts and coupons on your blog. 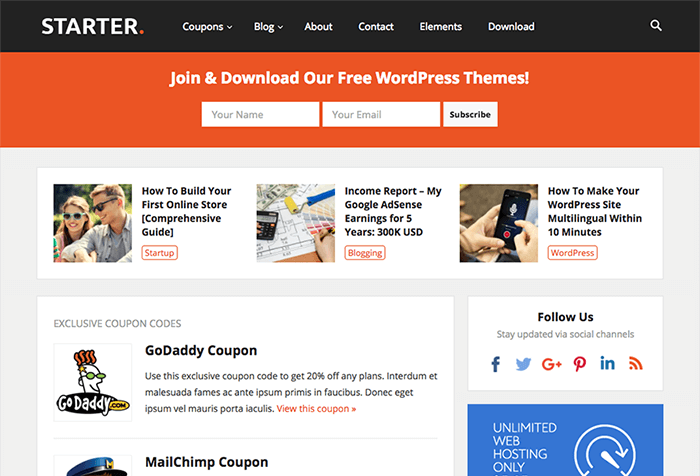 Starter is a stylish WordPress blog theme that builds with coupons/deals functionalities. The starter is another fast loading and with SEO compatible WordPress theme. It is giving a great outlook to the reader activity from the user end. It is suitable to run PRO blog and you can run any affiliate programs by providing coupon codes to your blog readers. The features are same as above MakeMoney WordPress theme. 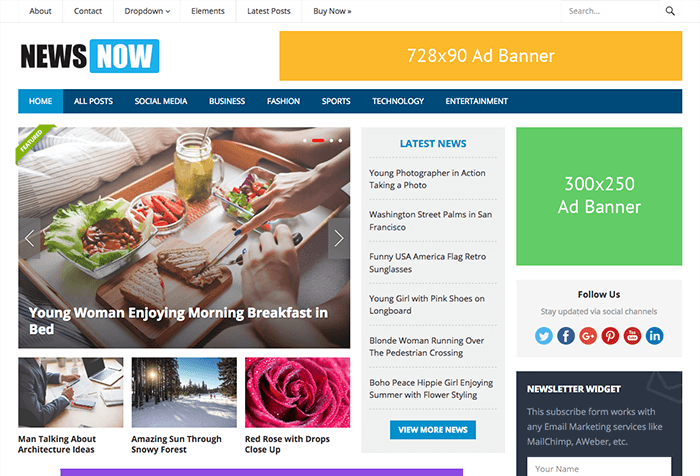 NewsNow is a great theme with the powerful and responsive layout. 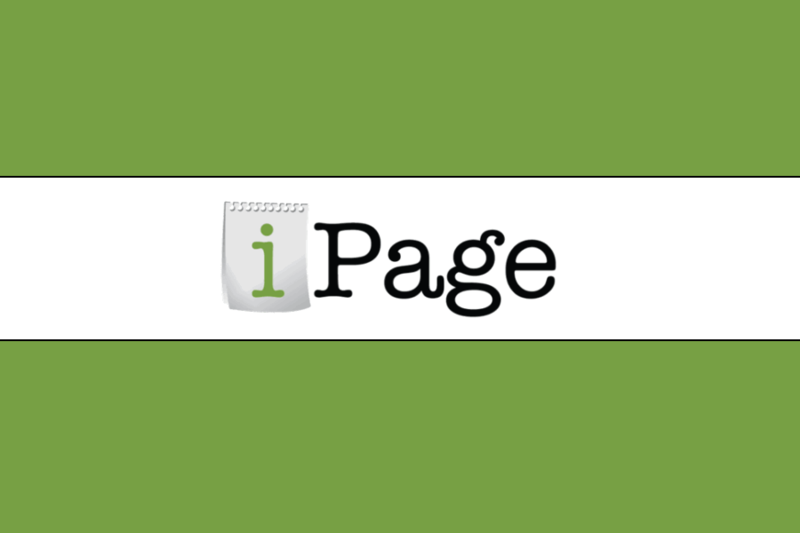 It is an excellent theme for News, Newspaper, magazine, and review site blogs. It is easy to use. 100% Responsive: It gives the full control of your website and visitors attention on the desktop and on all mobile devices. Ad banners optimized: You can place the ads anywhere on the blog to get higher CPC and RPMs. Attractive Home Slider: You can create an attractive Home slider with this built-in script. Plenty of Fonts: Integrated hundreds of Google fonts. You can change the fonts easily. Unlimited theme colors: You can choose different unlimited colors and design your layout look colorfully. Advanced Block system: Each blog gives the fresh look and creates multiple posts at one place as category wise. It gives beautiful layout for your blog. 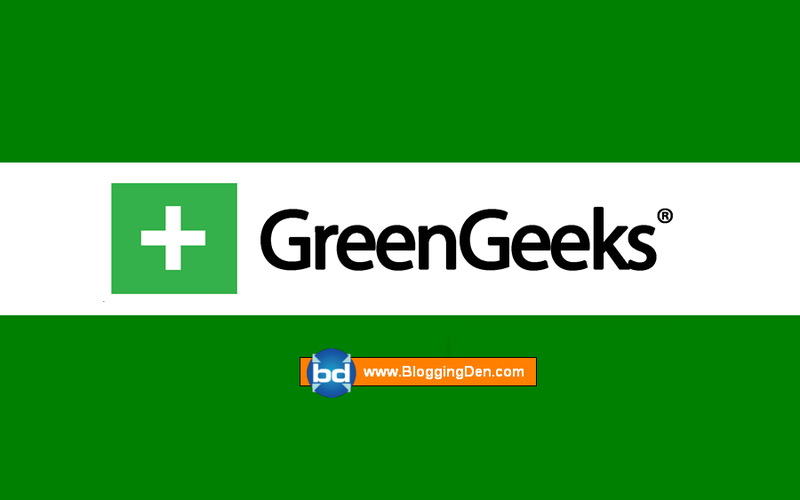 Advanced Posts Widgets: You can use these simple drag and drop easy post widgets like most commented posts, most clicked posts, random posts and for recent posts. 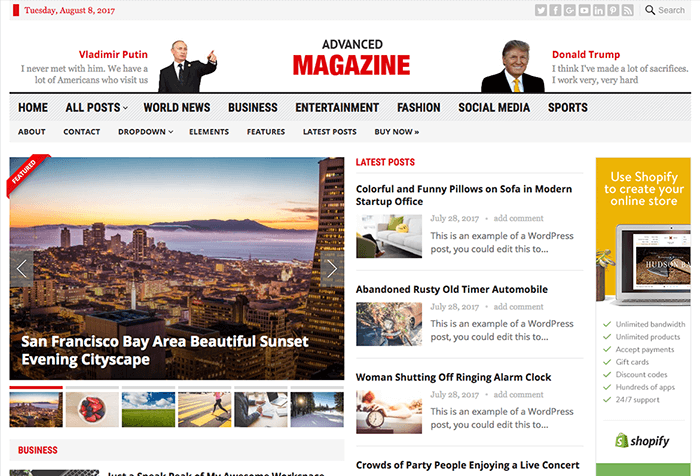 Advanced Magazine WordPress theme is suitable for Newspaper blogs. You can write the posts easily. This theme is suitable for a News, Newspaper, and magazine, publishing and review sites. 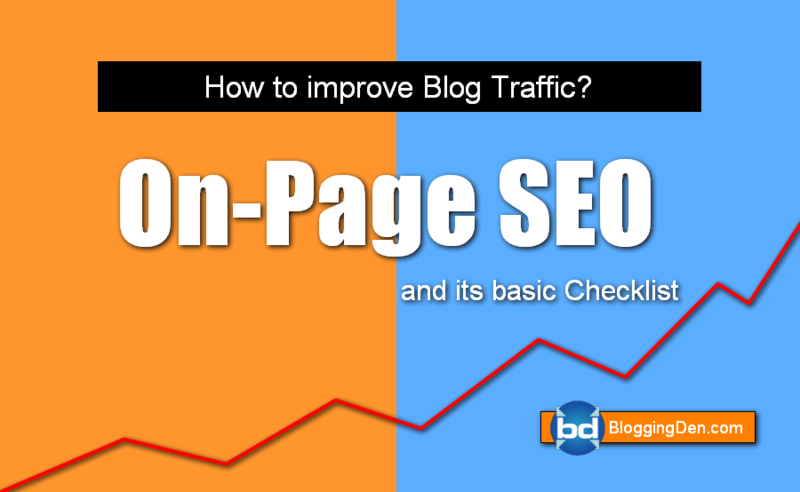 It is fast, elegant, SEO optimized, and easy to use. It supports responsive Google ads and Adsense. 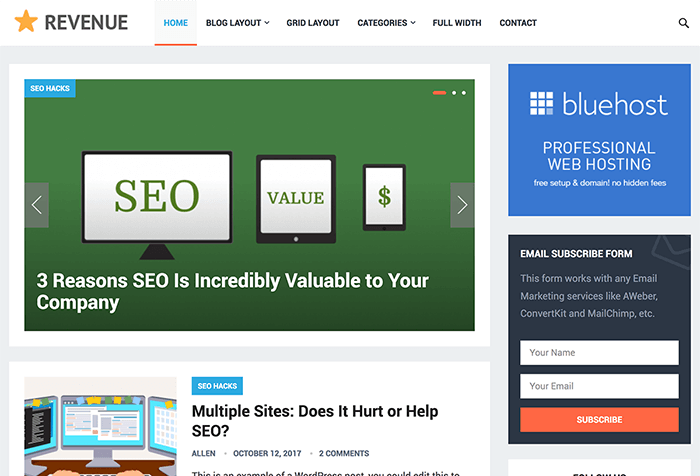 Revenue WordPress theme is a newly release theme. 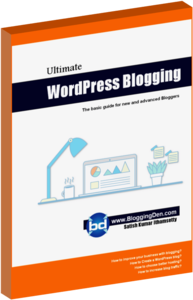 It is suitable for new WordPress users, Pro bloggers, SEO marketers, and Businesses. The theme is giving a fresh look to the users. It is fully SEO optimized as per search engine standards. The above premium WordPress themes are very good. Personally, I used these themes for my blogs. I am getting good results for my blogging journey. If you want more themes don’t forget to visit the Happythemes page. There are 17 themes are ready to download. They are providing 15 Premium themes and 2 free themes (Updates not supporting) for their members. So do not waste your time. Become a member and download all the premium WordPress themes immediately. Happythemes are providing simple and attractive plans and pricing structure. 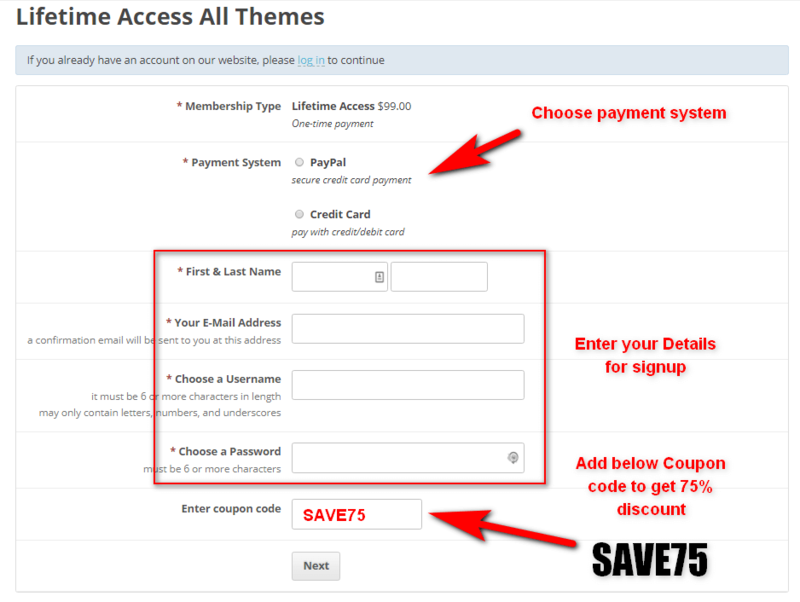 They also offer a free membership option to access their free themes. Happythemes are having only two plans for new customers. 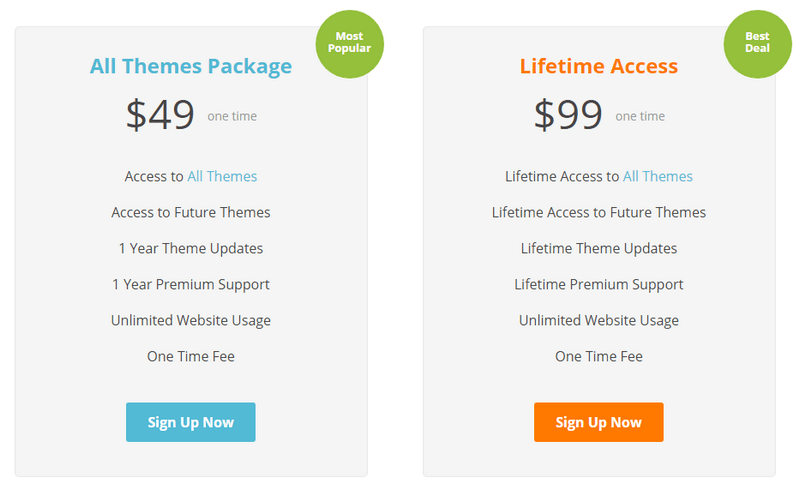 For premium themes, you need to take Lifetime Membership for a one-time payment of only $99. This membership gives the access to all the present and future themes, unlimited theme updates and unlimited support. The $99 price for lifetime access is a great choice. I am not sure how long the price will remain. 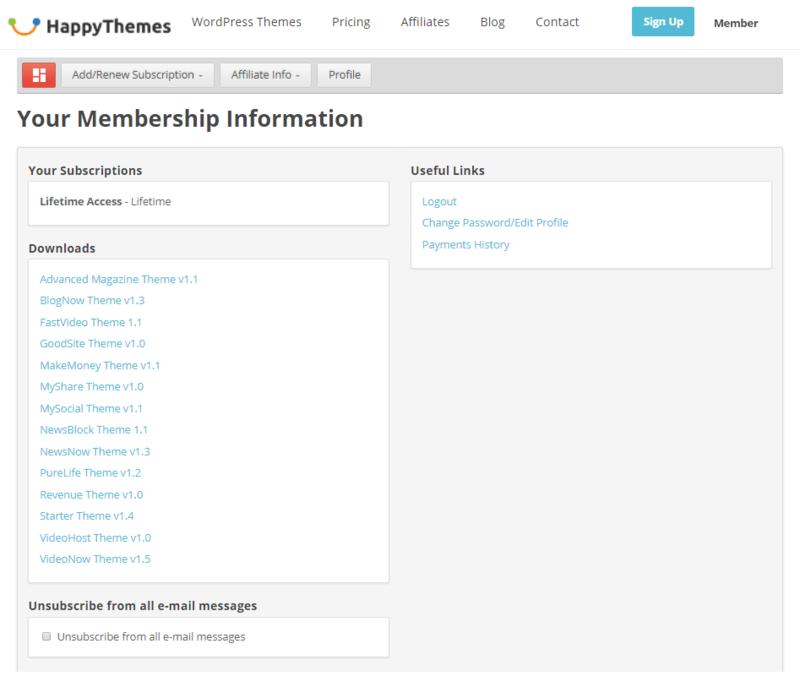 Happythemes are recently announced their lifetime membership access discount up to 40% Yes you heard right. You can save 40% on your new lifetime membership purchase. No doubt this is a great investment for your future blogging journey and for your digital marketing agencies. Definitely, your clients will be satisfied with your support. To grab this 40% discount following the step-by-step picture guide to get lifetime access. First, you need to click the below link. You will be redirected to the Happythemes homepage. Now click on the Pricing tab from the top menu. You will be redirected to the plans and pricing page. Then choose Lifetime access plan and click on Sign up button on the table. In this step, you need to choose the payment mode. The team is accepting two payment systems. They are Paypal and Credit card system. Choose one payment system. Now enter your Name, Email address and Password (your choice). Finally, enter the Happythemes discount coupon code in Enter coupon code box as “SPRING2018” to get 40% saving on the original price ($99). Update: Happy themes deal 2018 for the month of May is 40% discount is running. Use this code to grab the mentioned discount on lifetime access. The above code recently expired. Just updated with new Code below to get 40% savings. If you choose PayPal system to make your payment, choose PayPal then click Next button. The page will be redirected to Paypal login page. Enter your papal login details and complete payment process. If you are choosing Credit card payment system, you will be redirected to secure payment gateway channel and will ask your credit card details. Complete your payment process. After complete your new purchase, you will receive activation link, payment invoice receipt. First, open activation email and click the link to activate your account. Then next open invoice receipt email and download the file. Keep the download for future reference. After clicking your confirmation link, you will be redirected to Happythemes members dashboard. You will get all the updated themes. Just download those themes and enjoy. It is a lifetime membership. All the HappyThemes premium WordPress themes are licensed under the GNU general public license. You can remove the themes copyright information from the footer and you can place your own links. Simply you can do any modification to your themes. Happythemes newly launched WordPress themes shop. If you feel this is right investment, you can go to this store. Every theme has been created with great codes by WordPress themes experts and developers. All themes are fully responsive, SEO optimized, Ad responsive and Blazing fast loading functionalities. Another important thing is that Happythemes premium WordPress themes are at a really low price. If you compare with other premium WordPress themes stores. Every theme supports customer needs. The pricing is so attractive to take your future projects. I hope this Happythemes review 2018 is helpful to you to know the pricing, technical features and many more.